A lot of issues are vehicles for more than just transportation comfort and. We like to look them up for work but all sorts of heavier larger items in them move the team around town or just fill them up for a weekend. Many of us pulled trailers boats and all sorts of work related items. And some of us simply one more ride control performance that came on the vehicle originally. KYB has a solution for all of these demands conditions arriving. Physical pain from the factory equipped with a mono to design shock absorber now the owner wants to restore the handling and control the what the vehicle had originally became widely yes it just is the right product. 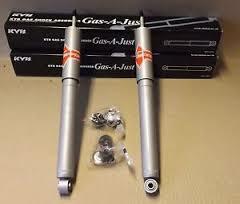 These vehicles came from the factory with a twin tube design shock absorber the gas a just as a great choice when you want to upgrade the performance of the suspension over the vehicle’s original design let’s take a closer look at why gas adjust is a great choice for all of these vehicles. Welcome to the key YB garage I’m mac this is Erin and this is the gas adjust shock absorber view here http://turnitupmedia.com. Now the name gassy just stands for gas automatic adjust. Simply put the gas adjust will outperform the average twin tube design found on most vehicles and it has a unique ability to deliver more performance just when it’s needed since some vehicles come from the factory already equipped with a higher performing mono to design came when he makes this unit as a direct replacement to restore the vehicle’s original design performance. But. I guess it just is also available as a performance upgrade for vehicles that came equipped with standard twin tube shocks. Here’s 2 very different cut away examples so that I can show you the difference. Both have a shaft moving piston and hydraulic valving. This one is a typical twin tube shock he uses a smaller working cylinder and during operation fluid has moved in and out of it outer fluid reservoir that works pretty well but the design isn’t as efficient when you need or you want more performance. As you can see the kid would be gas adjust mono too has a larger single working cylinder the main benefit is that the hydraulic fluid doesn’t have to travel as far. All kept in the upper cylinder so the valley can respond faster. A place of a fluid reservoir there’s an additional nitrogen gas high pressure chamber in the lower section. On light vehicle movement the gas pressure cushions the ride and when you need performance and there’s more aggressive vehicle movement the now compressed gas pressure expands and adds vehicle control so when you install the gas suggest as an upgrade you get quicker more responsive handling control along with this more stable ride the with the vehicle had originally were when you install the key why bagasse adjust on a vehicle that came from the factory with monitor designed you restore or keep that vehicle’s original performance characteristics. I guess it just is a great choice when you want something more than the original design. What do you just want the more responsive handling or perhaps you carry heavier loads the normal or tow a trailer will get more stability and less body roll to. So when we say restore or more we’re saying it’s up to you. I guess I just I just just the right higher performance. Previous: Aluminium levers: repair or replacement.